Weekends are so precious now that they deserve special mention in this little space. 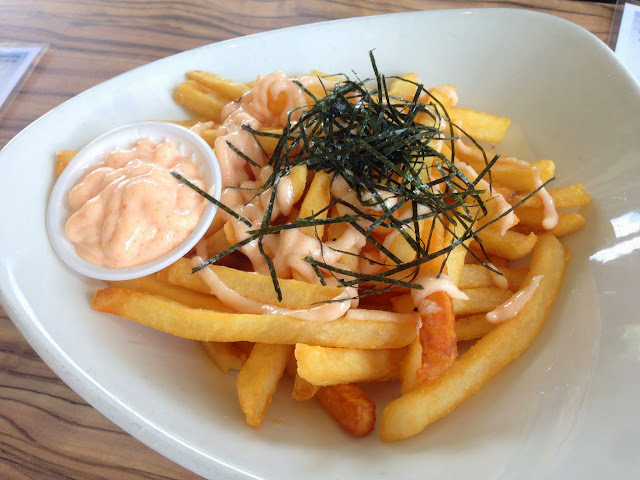 GRUB – American style food with a smattering of Japanese ingredients here and there. I was expecting impossibly long queues but thankfully, we managed to get a seat indoors as soon as we got there. Mentaiko Mayo + Seaweed = umami bomb! Friends were tempted to steal the untouched mentaiko mayo from the table next to us. Fries were nicely done. 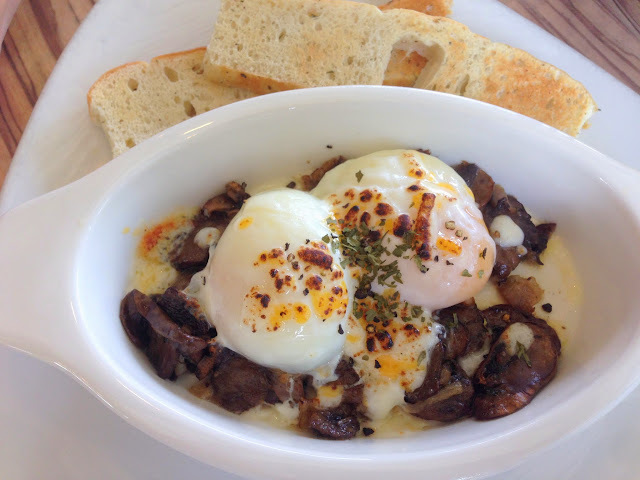 Eggs with truffled mushrooms. Truffle was too faint, but other than that, a pretty fail-safe dish (unless you don’t like eggs or mushrooms). Something I plan to replicate during one of our brunch parties. The GRUB burger. The patty isn’t the dripping juices (i.e. omakase burger) kind but it was tasty and good enough. I quite liked it actually. 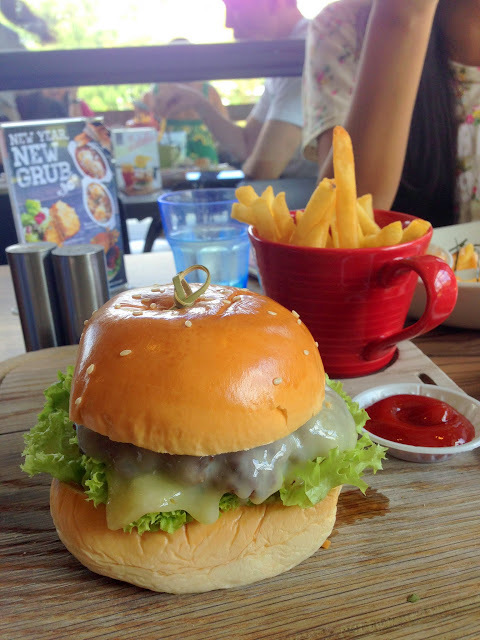 A blanket of melted cheese, well done but still moist patty, soft fluffy hamburger buns and crisp lettuce. GRUB is situated in bishan park. They make full use of their surroundings with the alfresco porch and full length windows. Food is simply done, but fresh and very affordable (spent $35 for everything) for the kind of food they are serving. Then we drove off to Nunsongyee. The area is very ulu- good luck trying to find it. It’s inside some sort of compound with trampolines and indoor pools for babies… In short, just follow your GPS. 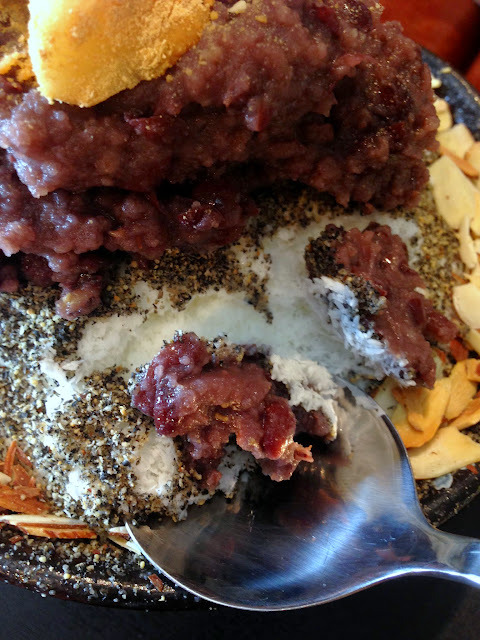 (iii) traditional bingsoo has bits of mochi and multi-grain powder. 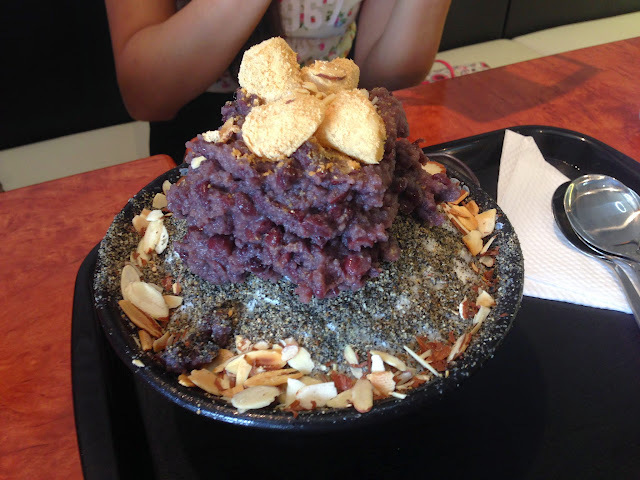 We went for the black sesame bingsoo and it was SO GOOD!!! Our misgivings of spending ~$20 were immediately extinguished. It was so good that I felt it was better than many versions we had in Korea. The red bean was definitely NOT out of a can. It was homemade and, best of all, not excessively sweet. The black sesame powder was very good and they thoughtfully added another layer of black sesame and multi-grain powder layer in between the shaved milk ice. It’s the little things that count! There was also condensed milk at the bottom but they gave us some separately in another saucer just in case we needed more on top. My advice is to dig deep at the beginning to try to get the condensed milk out on top otherwise it gets a bit too sweet if you add the extra condensed milk. We were so thrilled by the space too because it felt like any cafe in Korea. It’s very spacious with high ceilings. The kind of place you want to study in (yes we felt like studying at the cafes in Korea but we realised we had nothing to study haha). Hope everyone is well and good! Work has been crazy busy. I’ve been making lots of rookie mistakes, but the bosses are still quite tolerant of me (I think). Sometimes, I think I create more work for them with my mistakes x.x Well I’ll just continue being thick-skinned and accept whatever work they give me, big or small. On this note, I wish everyone a lovely and fulfilling week ahead~ Oh, and the CNY weekend is drawing near!